Winter is about to start, and I am totally not ready for it. Please tell me I’m not the only one?! We can do two things now: cry and hibernate for the next four months OR beat the winter blues by daydreaming about tropical destinations. Therefore, let’s do a flashback to Aruba! 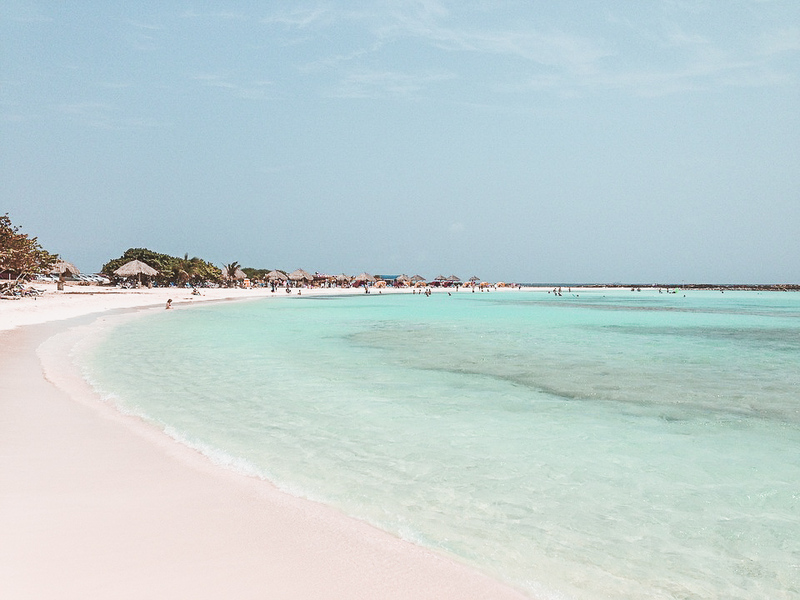 If you’re searching for a sunny and gorgeous destination to escape the winter cold, then Aruba has all you need. It is home to some of the bluest waters I’ve ever seen, and this Caribbean island has an average yearlong temperature of 28 degrees Celsius (83 in Fahrenheit), making it an excellent choice for a beach destination. Palm Beach is the most well-known beach in Aruba, and it is home to many high-rise resorts offering plenty of entertainment to its visitors. A perfect day at Palm Beach includes swimming and snorkeling in the blue sea, activities like renting a jet ski, enjoying some drinks and bites at one of the many beach-bars (Bugaloe and Moomba Beach are very fun hotspots) and going for a sunset walk along the resorts, eventually followed by a beach dinner. Hit the entertainment district once the sun is down. Whether you’re into shopping, casinos, nightlife or cinema, Palm Beach has it all. Take a sweater with you for the cinema as the air-conditioning makes it quite chilly inside. As for the casinos, many offer free drinks to their visitors. Cheers! 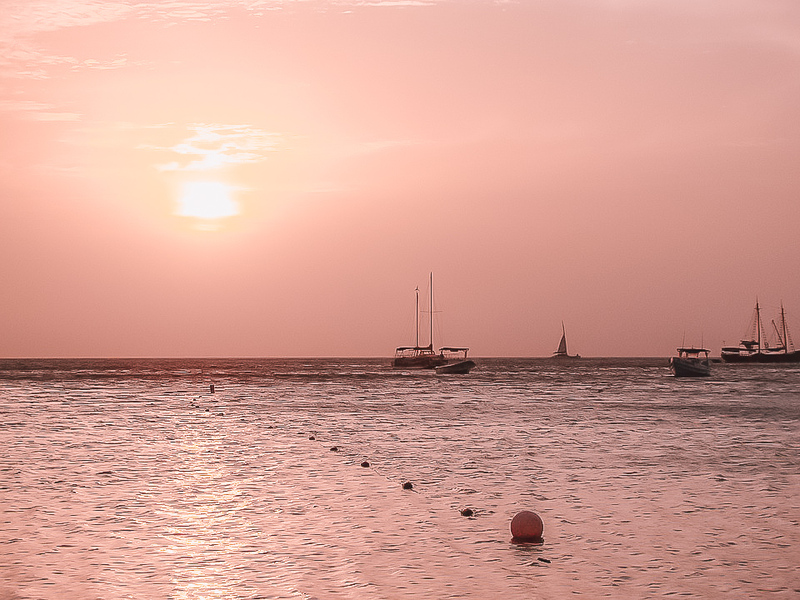 Want to see a postcard image of Aruba with your own eyes? Head to Eagle Beach then. 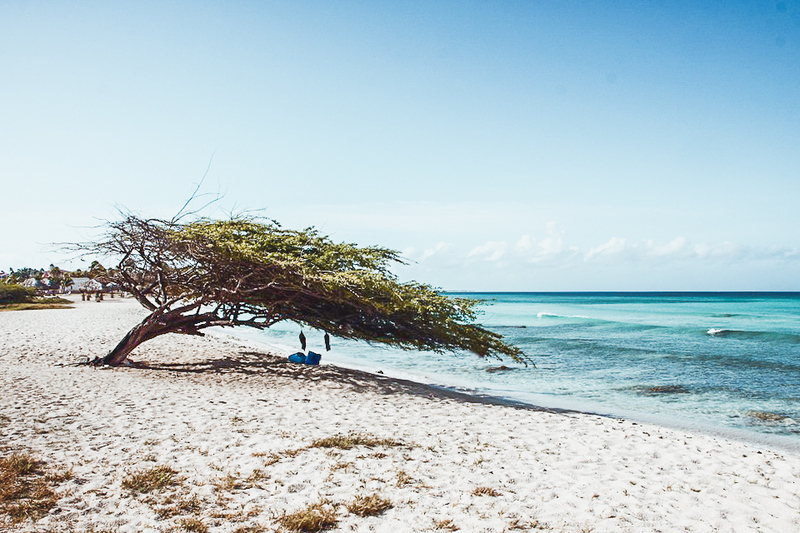 This beach is where the famous fofoti trees grow, unique to Aruba and the symbol of the island. Not only that, Eagle Beach is also the broadest beach of Aruba and named as one of the most beautiful beaches in the world. I totally agree with that! Depending on when you visit Aruba, you might even be able to attend a festival on Eagle Beach. I really enjoyed Flip Flop Festival, an annual event with live bands and DJ’s. The sound ranges from Caribbean beats to electronic music. 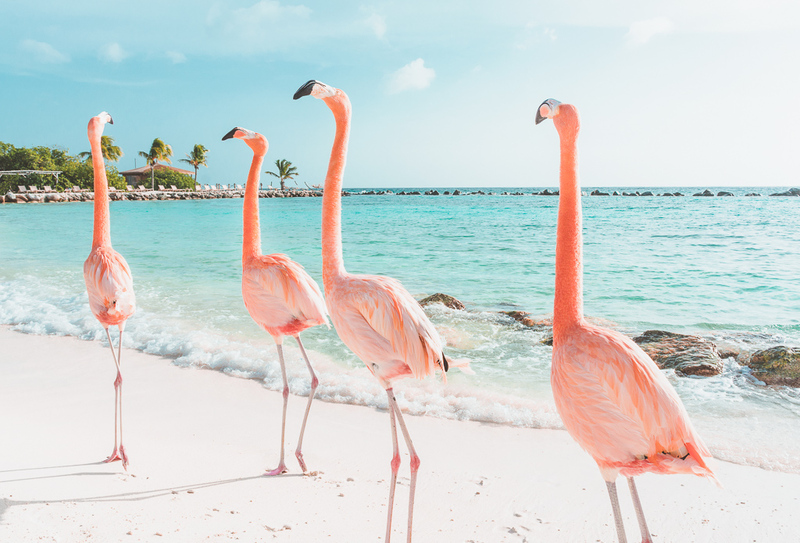 Another postcard image of Aruba: pink flamingos on the beach! Seeing them – and posing with them for a photo, of course – is a bucket list item for many travelers, but there is a catch. There are no wild flamingos in Aruba, the flamingos that you see on photos live on a private island just off the coast. This island belongs to the Renaissance Resort, located right next to the capital city of Oranjestad. There are two ways to visit the Renaissance island, you either stay at the resort or you buy a day-pass for $99. This day-pass includes lunch and a drink, and please keep in mind to call on forehand to purchase a day-pass as they are limited. The Renaissance Island has two beaches: Flamingo Beach and Iguana Beach. The main difference between these two beaches is that Iguana Beach is very family oriented and Flamingo Beach is adults-only. Mangel Halto is the place to go in Aruba when you prefer a more secluded beach. The cabanas at Mangel Halto are public and you have plenty of shade here to hide from the sun. The presence of mangroves makes it a popular beach for active travelers, offering the possibility to kayak and Stand Up Paddle boarding to the open water. Since it is located at the edge of a reef, many divers also go to Mangel Halto Beach to enter the sea. Go to the southernmost tip of Aruba for that true Caribbean paradise vibe. Here you’ll find Baby Beach, a halfmoon shaped white sandy beach with crystal clear water. Baby Beach has all the facilities for a carefree beach day, making it a haven for tanning, swimming and snorkeling. This is not a beach, but definitely worth a visit. 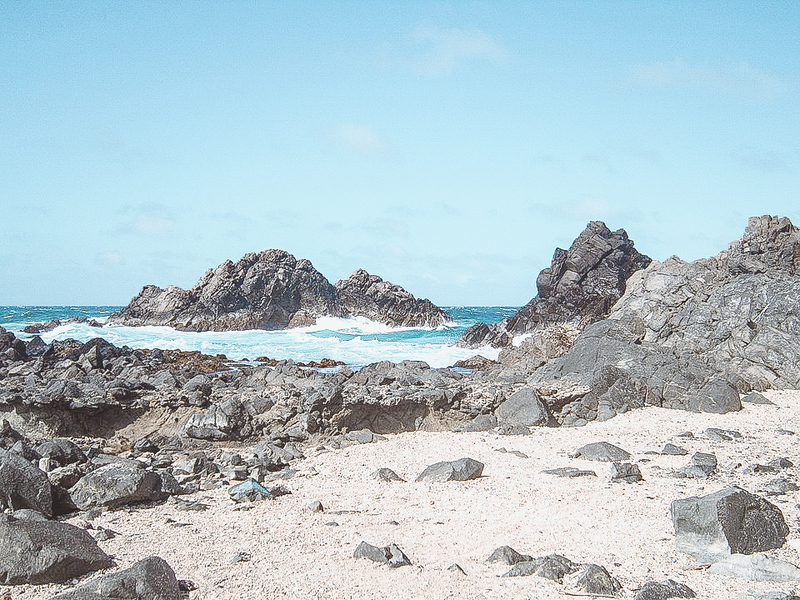 The natural pool is located on the north coast of Aruba in National Park Arikok and was formed by volcanic activity. It is an adventurous place for swimming and its azure waters make it a very photo worthy spot, however it is not accesable by car. It is recommended to book a tour if you wish to visit the natural pool. What's your favorite spot for fun in the sun on Aruba? *FYI: this post contains affiliate links. If you purchase something through them, I receive a small commission at no extra cost to you. Thank you so much for your support! Neem deel aan het gesprek met af en toe een e-mailGet notified of new comments on this post. If discussion generates more than a few emails daily your subscription will be paused automatically.